How exactly can printing ink be measured? For some years now, the possibilities of colorimetric measurement of printing inks have become simpler and cheaper. And so it is often believed that measuring printing inks is simple, inexpensive and, above all, highly accurate. And this also across a wide variety of brands and generations of measuring devices. Is that true? If you look at a few studies, that does not necessarily seem to be the case. IFRA, for example, requires that when measuring BCRA ceramic tiles the colour differences between different measuring instruments should be below Delta-E 0.3. In reality, however, things looked different. In a Nussbaum study, 8 out of 9 measurements were for a Delta-E greater than 2.0; in a Wyble & Rich study, the deviations were between Delta-E 0.76 and 1.68. But why are the deviations so large? On the one hand, the measuring instruments differ in the way they illuminate the surfaces to be measured. This is important in two respects: On the one hand, measurements can vary greatly depending on the material, for example, because light is emitted and measured from only one light source onto the measuring surface. If a measuring instrument has only one lamp, which, for example, radiates at an angle of 45 degrees onto the measuring surface and whose reflection is measured, then the measurement can deviate by up to Delta-E 3.0 if you only rotate the measuring instrument about its own axis. If a left-handed person and a right-handed person measure the same tiles with the same measuring device, then just by holding the measuring device differently and by the different lighting angles of the tiles a measurement can be completely different. The solution for this: In a measuring device, several light sources are distributed or, in the best case, the illumination is emitted directly circular at an angle of 45 degrees in order to minimize such effects. 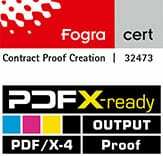 Since 2009, printers and proofing service providers have increasingly encountered a new D50 lighting standard: ISO 3664:2009, which defines how the new D50 standardized light, under which proofs and print products are to be evaluated, looks like. The new standard light contains UV components that address the optical brighteners that are frequently used in offset papers nowadays. The result: next to a bluish-white glowing sheet in the pressroom, there is a yellowish-pale proof. What is the reason for this? The standard came sort of as a surprise and was poorly communicated within the industry. All proofing substrates available from proofing service providers contain no or almost no optical brighteners – this was previously a requirement. And under the old D50 standardized light – which did not contain any UV components – the proof and production run looked identical, since the optical brighteners were not addressed in the production run. Proofing and production printing can no longer be compared on all new presses that are already equipped with light tubes of the new standard: This looks completely different, the differences in paper white are absolutely obvious. Printers and proofing service providers have mostly replaced the old tubes with new ones. However, this is often a complex topic: The old diffusing screens, which are mounted in front of the neon tubes, had so far predominantly once again installed UV filtering in order to ensure that completely no UV components get through. If new ISO 3664:2009 tubes with a defined amount of UV components are mounted behind the diffusors, unfortunately exactly this component is missing in front of the diffusor again… So there are some extra costs for the printers. In the meantime with M1 and the new proofing Standards Fogra51 upwards, many proofing papers with brighteners havel been launched on the market so that proof and run can be compared cleanly again in the pressroom. A proof is only as good as the light under which it is viewed. Just going to the window or switching on the light at dusk is useless: between December and July, between 8 am and 8 pm, between cloudy and sunny days there is a huge difference in the lighting, which makes any colour evaluation impossible. And if you switch on the light, you normally switch on a bulb with 2700 Kelvin – or even worse: an energy-saving neon bulb that somehow shines in any spectra… a disaster! The reasons for metamerism effects (in short: that two colors look identical under one light, but completely different under another) lie in the different printing technologies. Colors that look the same under a light bulb can suddenly look very different under a neon tube. In recent years, ink-based digital proofs have established themselves in the proofing sector. Because it is printed in ink, specially coated paper must be used, which is not in any way similar to the subsequent production run. Anyone who has ever tried to print on glossy coated paper with an inkjet printer knows: the ink never lasts! Metamerism is therefore always involved when a proof is to be compared with offset printing. The light under which proof and production run are viewed is particularly important. ISO 3664 regulates standardized light, which is important for viewing proofs and prints. D50 is no longer D50: The International Lighting Commission CIE has revised ISO 3664 in recent years and adapted it to today’s circumstances. If UV components used to be strictly prohibited, they are now part of the standard. In the past, the focus was on consistency between slide and print, while today monitor, digital proof and offset printing are important. Therefore, proofs must always be viewed under D50 Standardized Light, so that they are really “colour-binding” in their perception. If you want to check metamerism effects, we recommend the UGRA colour temperature indicator. With these strips, metamerism effects can be checked very quickly and clearly.